In the shadowed light to see the road. Here, the water is a softer mirror. The river pours its heart into its work, water as delicate as skin. I won’t be delicate like that again. But I will work. 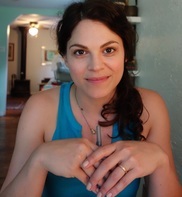 Meghan Sterling is a poet, writer and writing teacher living in Asheville, North Carolina with her husband, Matthew, daughter Adeline, and cat, Beatrice. Sterling’s work has been featured in WNC-Woman, the Yellow Chair Review, Allegro Poetry Magazine, Cladesong, Clementine Poetry Journal, the Chronogram and others. Her chapbook, How We Drift, was published in September, 2016 by Blue Lyra Press, as part of their Delta Chapbook Series.